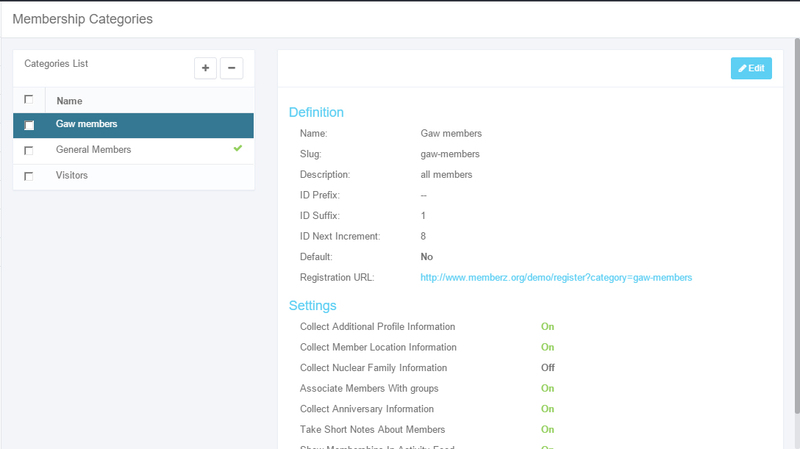 With Memberz.Org, its all about membership data management and the best way to manage anything is to break it down into manageable chunks. Here are the two major ways to do that with this platform. Membership Categories are the highest level at which you can categorize your membership data. You can use these to represent the larger sets of members in your organization. For example you can separate the Adults from the Children or the main members from Visitors. You also can separate members by campuses if that makes sense for your organization. For organizations like Alumni, you can choose to use the categories to separate members into the various year groups. Specifying numbering schemes for members. New members created are auto assigned numbers based on the scheme you define. The numbers can have prefixes or suffixes and an auto incrementing count. Specify whether you should be notified about birthdays of members in the category. Additional Profile Information – Hometown, Nationality, Employment Status, Educational Background, etc. In some categories, for example, nuclear family information is relevant but may not be for others. This flexibility helps with gathering data that is relevant. These are general small groups within your large organization where members in any of your major categories can belong to. These help you to define functional areas where members of your organization function. These groups can have leaders defined and members can moved between groups easily. See our how to setup groups article for more information. When generating reports, you would often be required to specify the Membership Category to filter your data at a high level and then you can further filter on the smaller groups to narrow down your result sets. These tools should help you make your community data management faster and much easier in the long run. Let us know via our social media channels what challenges you have and we’ll be glad to assist.